OK, Got this Waterford R2200 (yep. it is pre-owned), been building it up and did a test spin in the neighborhood a week or so back. In just a few feet of rolling the stem seemed off, no big deal, stop pull out 6 mm wrench, loosen and adjust. A few more feet OK, too much back the other way. Couldn't get it right. Bike seemed fine otherwise, but I started thinking something is out of alignment or not centered (including myself!). So, measuring and checking, I convinced myself the fork was out of alignment. I had verified frame at rear seemed good with the string wrapped around the headtube from each rear dropout. Anyhow, finally got myself some threaded rod, nuts and washers from Home Depot and lo and behold, the dropouts at both end seem pretty much dead nuts (threaded rod at both ends are within 0.015" or .5 mm). This seems good enough to me, but need some experts thoughts. Wheelset is newly built and dish/centering seems good, yeah, my dishing took is a piece of junk, but with care, dish and centering in each wheel certainly seems within a millimeter. Am I missing anything here with this? Maybe reassemble and carefully check wheel centering and dish again? Get better dishing tool? So specifically what symptoms made you think it wasn’t tracking correctly? I have a bike with a similar issue and I've just been pretending everything is fine because I don't want to admit something is wrong. But you have motivated me to finally get to the bottom of my issue. Sorry I don't have any advice, best of luck and thanks for pushing me to sort my frame out. Do you have a known good fork you can swap in? That would narrow the problem down to the fork or the frame, hopefully. I'd hate to be messing with the original fork if that's not the problem. My first thought - the headset. Is it new or in good shape? (I'd be looking for slight indents, esp on the bottom races.) Proper number of balls (especially - not too many. You should be able to fit in one more. If not, remove one.) as the frame been faced so the races sit parallel? (Being a Waterford, it should be but the previous owner could have done something.) Does the fork swing completely smoothly? Or does it want to self-center? Is the headset adjusted right and not too tight? Minor headset issues can completely thwart the most perfect frame. JohnD: what does coplanar with the frame mean? If blades are not out of position (foreward & aft) aren't they in sync with the frame? bargainguy: yeah, i have 2 other forks which as you might guess are assembled on 2 other bikes. After checks shown in photos, i'm not convinced fork (or frame) is an issue. 79pmooney: frameset came with a beat up headset that did not rotate smoothly, i installed a brandy new Chorus headset, seems good, though this makes me think i should double check to make sure the steerer tube race is fully home. 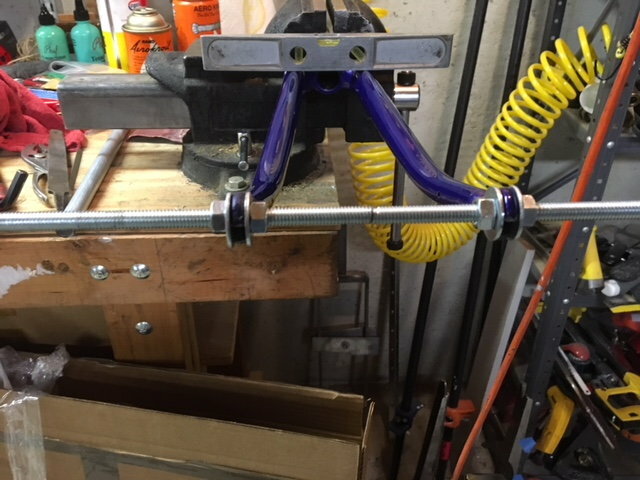 Cups pressed in with threaded rod and washers. Good input. I know this will get figured out, but its April and I'm not riding new ride yet...... Thanks. From reading your post, it sounds like the stem is not inline with the front tire. If true it as nothing to do with the fork being bent. Also riding a few feet is not good enough to see how the bike handles. Ride around the block going at least cruising speed. Starting from a dead stop will usually make the bike wobble, until you get some speed up. Did I miss something? what does coplanar with the frame mean? If blades are not out of position (foreward & aft) aren't they in sync with the frame? If the blades are such that the centerline between the dropouts does not align with the centerline of the steer tube, the front wheel will not be in the same plane as the rest of the frame, and the bike will pull to one side or the other while riding. Is that the problem you're experiencing? Can you ride a bike no handed? If so this will eliminate the stem's alignment from the picture. There's a lot more to frame alignment then having the drop outs (front and rear both) centered WRT the main triangle. Uneven blade length, seat tube/head tube twist, uneven chain or seat stay lengths being the biggies. 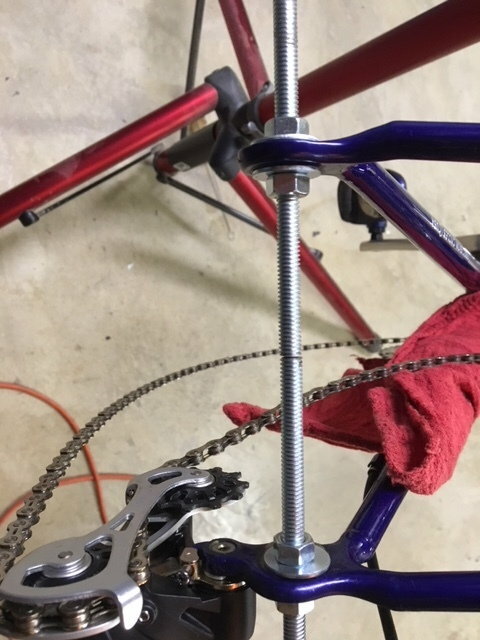 There's a lot of posts about frame/fork alignment here, over the years. Some by me. here's a link to one I kept that is a very base level of how to consider alignment in general. It's the one I could easily find right now. That's why I asked what the symptoms were, because if it is pulling to one side or the other but everything is aligned according to measurement, then it cold be the cables that are causing the front end to favor one side over the other. Sounds like it is visual though? JohnD: good point, i could probably check with a plumb bob or maybe lay it out with perpendicular lines on table or floor to at least get a feel for it. Andrew: good link, will need to digest. I can maybe ride my SLX frame Gitane no hands, a new set up, not so sure. I thought i had it in my profile, but i'm in SW Ohio (Cincinnati area). Don't rule out the possibility that the stem may be damaged or manufactured out of alighnment. so you may be attributing pull to the bike, when it's the road surface..
Last edited by fietsbob; 04-16-19 at 12:18 PM. Everyone, really appreciate the input here. I'll double check a couple of things, but think I'll get it on the road by the weekend to re-evaluate. Parts being used are new here, except the pedals (still running Look deltas). I found Randy's MyTen Speed web site to have an interesting trouble shooting test you might want to try out, he hangs the bike upside down. I used it to find a headset culprit and on another bike a fork that needed help. The headset showed differing planes every time it settled, frame to fork, and the tweaked fork showed a consistent slant off to the DS every time it settled. Fork was pulled and after a few minutes on our local frame builders fork table re-hanging showed the frame and fork perfectly coplanar. I have decided to take fork to a shop that i think will have the jig as i'm somewhat convinced it is slightly shifted to one side or the dropout slot differs. Figure its cheap and easy before i reassemble.